Christmas travel chaos is on the way for tens of thousands of Ryanair passengers next week as dozens of the airline's Irish-based pilots prepare to go on strike. Almost 80 staff pilots at the airline are set to engage in a 24-hour stoppage on December 20 - just as the festive travel rush gets into full swing. The strike next Wednesday will hit Ryanair operations across its three bases in Ireland: Dublin, Cork and Shannon. However, the impact will ripple out across Europe. Dublin is one of Ryanair's biggest bases, and it has more than 250 pilots based here. More strike days have been threatened by trade union Impact unless Ryanair management engages with the Irish Airline Pilots' Association (IALPA), which is part of Impact, something Ryanair chief executive Michael O'Leary has vowed never to do. Ryanair said it will "face down" the action, and warned pilots who strike that they will see pay increases and promotion opportunities suspended. While the strike will not ground all Ryanair flights in and out of Ireland, it could hit the airline's schedules across its European network. Ryanair has as many as 90 flights set to depart Dublin alone next Wednesday, with a similar number of arrivals expected that day in the capital. Pilots who are members of IALPA voted last week to support industrial action. The striking pilots are mostly captains. Each Ryanair flight needs to have a captain and first officer in the cockpit. Ashley Connolly, an assistant general secretary at Impact, said Ryanair was the only Irish-based airline that refuses to recognise independent pilot representatives. "This dispute is solely about winning independent representation for pilots in the company," she said. Ryanair said it will deal with any such disruptions "if or when they arise" and said it wanted to "apologise sincerely" to passengers "for any upset or worry" the threatened action may cause. "Every pilot who joins Ryanair clearly understands that we do not negotiate with pilot unions," the airline's chief people officer, Eddie Wilson, told pilots at Ryanair's Bergamo base, in Italy, in a memo. "Instead, we have a sophisticated and long-established system of collective bargaining which was endorsed by the Supreme Court back in 2007," he added. 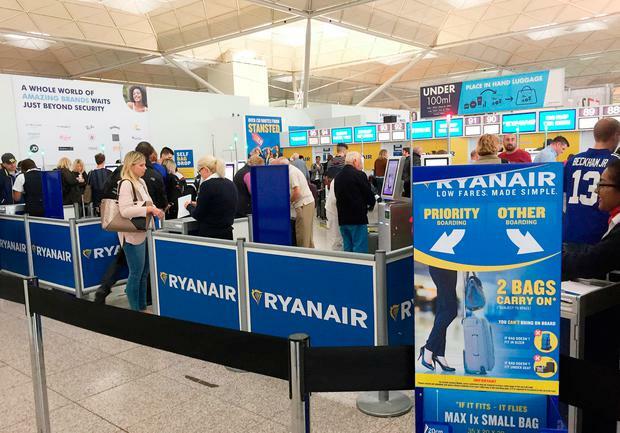 The battle for better terms of employment started in September after a pilot rostering fiasco that saw Ryanair cancel thousands of flights and ground aircraft into next year as it struggled to restore pilot schedules. The fallout saw Ryanair pledge to improve pay and conditions for pilots. However, pilots at a number of Ryanair's big bases have rejected those offers.